Xi Arrives in Washington, D.C.
Chinese President Xi Jinping arrived in Washington, D.C. Thursday to meet with his U.S. counterpart Barack Obama and other U.S. political leaders as part of his first state visit to the United States. Xi will receive a grand welcoming ceremony Friday at the White House, hold talks with Obama, meet the press and attend a state dinner. He will also meet U.S. parliament leaders and attend a welcoming luncheon held by Vice President Joe Biden and Secretary of State John Kerry. The two presidents will exchange views on bilateral ties, their respective domestic and foreign policies, and regional and international situation, to ensure that the new model of major-country relationship between China and U.S. further develop on a correct track. The two sides are expected to reach important agreements in economy and trade, energy, people-to-people exchanges, climate change, environmental protection, finance, science and technology, agriculture, law enforcement, defense, aviation and infrastructure development. 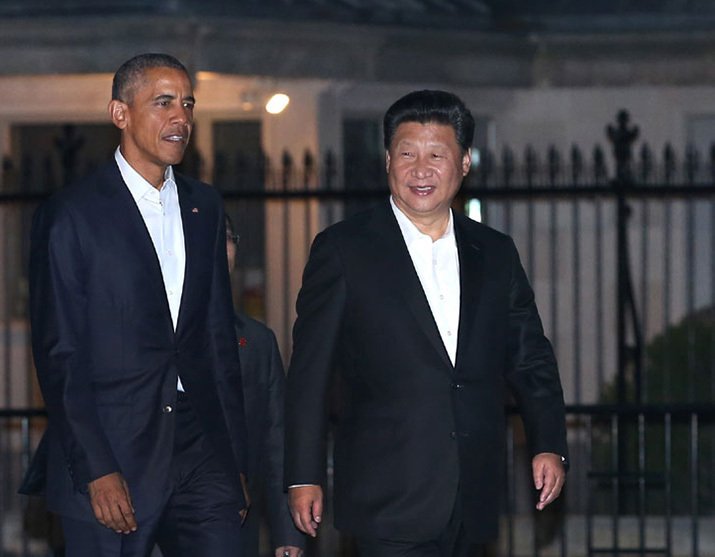 The Xi-Obama summit will be the fifth between the two heads of state. In June 2013, three months after Xi took over the Chinese presidency, he traveled to the U.S. state of California and held a no-necktie summit with Obama, during which they reached consensus on building a new model of major-country relationship between the two countries. Obama paid a state visit to China in November 2014, during which they enjoyed an exceptional night stroll in the Zhongnanhai compound in central Beijing. They also met in September 2013 and in March 2014 on the sidelines of two multilateral summits. Before flying to the U.S. capital, Xi just concluded a busy two-and-a-half-day stay in the West Coast technology and aviation hub of Seattle, where he put forward a four-point proposal on the development of the new model of major-country relationship. The Chinese president will be in New York from September 26 to 28 for a series of summits and meetings marking the 70th anniversary of the founding of the United Nations.